In addition to the familiar European honey bee, there are six other recognized species of honey bees, including the Indian honey bee, Koschevnikov’s honey bee, the dwarf honey bee, the andreniform dwarf honey bee, the giant honey bee, and the mountain giant honey bee. 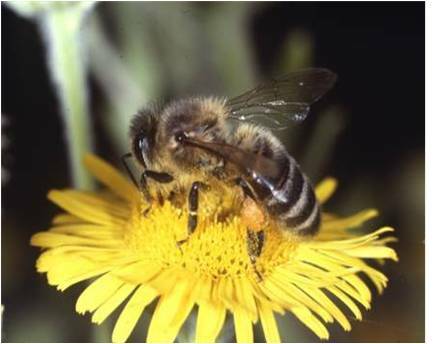 The European, the Indian, and to some extent the dwarf honey bees are the species that have been domesticated, although the European honey bee is by far the most widespread domesticated bee and the only species kept in North America. There are many races of the European honey bee. The ones most popular in modern beekeeping are the Italian, Carniolan, and Caucasian. Most honey bees used in hives today are mixtures of these and sometimes other races. Africanized honey bees, also known as killer bees, are a hybrid of African and European races naturalized in the western hemisphere. The honey bee is a social insect that can survive only as a member of a community, or colony. The colony inhabits an enclosed cavity, its nest. Domesticated colonies are kept in artificial containers, usually wooden boxes, known as hives. The honey bee community consists of three structurally different forms—the queen (reproductive female), the drone (male), and the worker (nonreproductive female). These castes are associated with different functions in the colony; each caste possesses its own special instincts geared to the needs of the colony. The queen is the only sexually productive female in the colony and thus is the mother of all drones, workers, and future queens. Her capacity for laying eggs is outstanding; her daily output often exceeds 1500 eggs, the weight of which is equivalent to that of her own body. Anatomically, the queen is strikingly different from the drones and workers. Her body is long, with a much larger abdomen than a worker bee. Her mandibles, or jaws, contain sharp cutting teeth, whereas her offspring have toothless jaws. The queen has a curved, smooth stinger that she can use repeatedly without endangering her own life. In contrast, the worker honey bees are armed with straight, barbed stingers, so that when a worker stings, the barbed, needlesharp organ remains firmly anchored in the flesh of its victim. In trying to withdraw the stinger, the bee tears its internal organs and dies shortly thereafter. The queen bee lacks the working tools possessed by worker bees, such as pollen baskets, beeswax-secreting glands, and a well-developed honey sac. Her larval food consists almost entirely of a secretion called royal jelly that is produced by worker bees. The average lifespan of the queen is one to three years. Worker bees are the most numerous members of the colony. A healthy colony may contain 80,000 worker bees or more at its peak growth in early summer. Workers build and maintain the nest and care for the brood. They build the nest from wax secreted from glands in their abdomen. 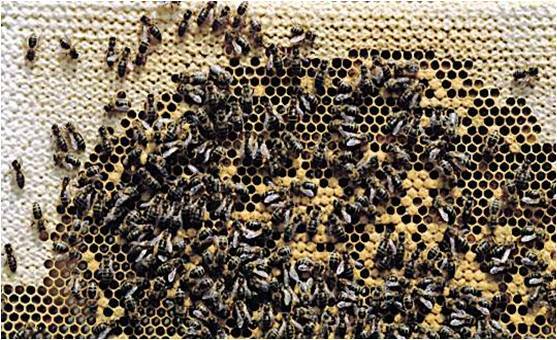 The hexagonal cells, or compartments, constructed by the workers are arranged in a latticework known as the comb. 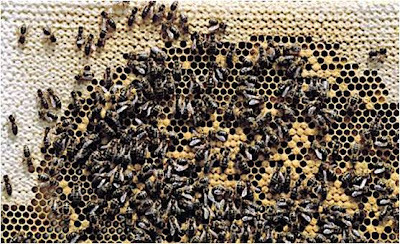 The cells of the comb provide the internal structure of the nest and are used for storage of the developing young bees and all the provisions used by the colony. 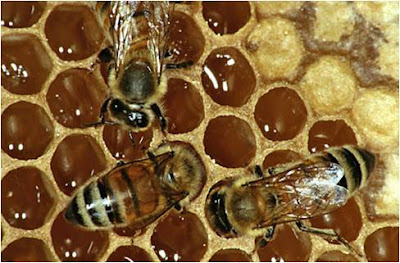 Comb used for storage of honey is called honeycomb. Workers leave the hive to gather nectar, pollen, water, and propolis, a gummy substance used to seal and caulk the exterior of the nest. They convert the nectar to honey, clean the comb, and feed the larvae, drones, and the queen. They also ventilate the nest and when necessary, defend the colony with their stings. Workers do not mate and therefore can not produce fertile eggs. They occasionally lay infertile eggs, which give rise to drones. As with all bees, pollen is the principal source of protein, fat, minerals, and vitamins, the food elements essential for the growth and development of larvae of all three castes. Adult bees can subsist on honey or sugar, a pure carbohydrate diet. Besides gathering and storing food for all the members of the colony, the workers are responsible for maintaining the brood at 33.9°C (93°F), the optimum temperature required for hatching the eggs and rearing the young. When the nest or hive becomes too hot the workers collectively ventilate it by fanning their wings. During cool weather, they cluster tightly about the nursery and generate heat. The eggs, which are laid one per cell, hatch in three days. The larvae are fed royal jelly for at least two days and then pollen and nectar or honey. 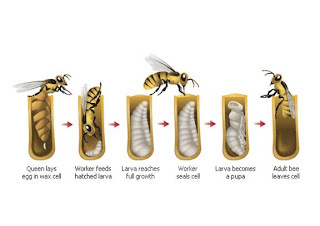 Each of the hundreds of larvae in a nest or hive must be fed many times a day. For the first three weeks of their adult lives, the workers confine their labors to building the honeycomb, cleaning and polishing the cells, feeding the young and the queen, controlling the temperature, evaporating the water from the nectar until it thickens as honey, and many other miscellaneous tasks. At the end of this period, they function as field bees and defenders of the colony. The workers that develop early in the season live extremely busy lives, which, from egg to death, last about six weeks. Worker bees reared late in the fall usually live until spring, since they have little to do in the winter except eat and keep warm. Unlike other species of bees, honey bees do not hibernate; the colony survives the winter as a group of active adult bees. Drones are male honey bees. They are stingless, defenseless, and unable to feed themselves—they are fed by worker bees. Drones have no pollen baskets or wax glands and cannot secrete royal jelly. Their one function is to mate with new queens. After mating, which always takes place on the wing in the open air, a drone dies immediately. Early investigators of the mating habits of the honey bee concluded that a queen mates only once in her life. Recent scientific studies, however, have established that she usually mates with six or more drones in the course of a few days. The motile sperm of the drones find their way into a small, saclike organ, called the spermatheca, in the queen’s abdomen. The sperm remain viable in this sac throughout the life of the queen. Drones are prevalent in colonies of bees in the spring and summer months. As fall approaches, they are driven out of the nests or hives by the workers and left to perish.